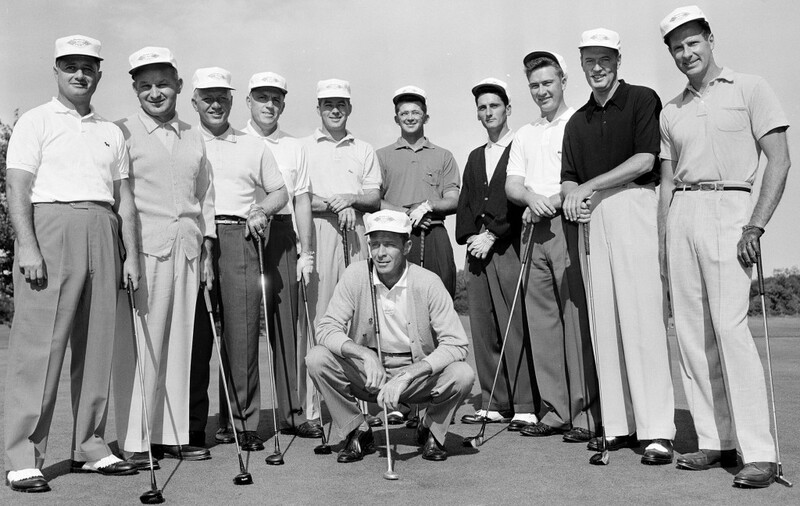 U.S. Walker Cup team, 1957. Charles Coe, the captain, is squatting in the center. Billy Joe Patton is fifth from the left. The American Federation of Television and Radio Artists declared its first national strike on March 29, 1967. That meant that CBS’s usual golf commentators, who were members of that union, could not participate in that year’s Masters broadcast, the following week. Clifford Roberts, Augusta National’s chairman, conducted auditions among the club’s membership, and settled on two distinguished amateur players, Charles Coe and Billy Joe Patton, to fill two of the vacant spots. Coe had won the U.S. Amateur twice and had been the runner-up to Jack Nicklaus in 1959, and in the 1961 Masters he had finished tied for second with Palmer. Patton had led the Masters after two rounds in 1954, then ended up in third place behind Snead and Hogan. Both men had played the course for years—Coe with a handicap that varied between plus-6 and plus-7. Coe and Patton did creditable jobs as commentators, and their minimalist dialogue confirmed Roberts’s belief that less is more in golf broadcasting. CBS was pleased as well, and William MacPhail, who was the network’s director of sports, passed along a sampling of the large volume of complimentary mail the network had received. One viewer wrote, “[T]he quiet, sincere comments of your members, which were entirely adequate, were a refreshing change from the glib, and sometimes overly talkative, ‘pros’ we usually hear.” Another wrote, “What an absolute pleasure it was to watch a player, under severe pressure, walk up to a putt in silence—the silence any gallery always accords a player, but which the announcers feel impelled to fill with chatter. In this case, one truly felt present, with a real sense of actual participation.” The broadcast turned out so well, in fact, that CBS executives credited it with breaking the strike, which ended the day after the tournament. Not much silence nowadays. Worth trying? This entry was posted in Golf Courses, Masters, Masters Countdown, Television, Tournaments and tagged Billy Joe Patton, Charles Coe, Clifford Roberts by David Owen. Bookmark the permalink. David….I believe the man in the glasses is Mason Rudolph…..I think BJP is the one to the left (looking at the photo) of Rudolph. Yikes, Bill, you’re absolutely right. I’ll make the change. Thank you! What – am I the only viewer who appreciates Terry Gannon’s “Wall of Sound” style??? ?